Fall has arrived, bringing Halloween decorations, yard signs, and… wild turkeys? Last week, several residents of Crestwood got a visit from an unusual seasonal friend. This is not the first time wild turkeys have made a stir in our area. In 2013 several wild turkeys were spotted walking around 16th Street Heights and Adams Morgan. One was even spotted taking a leisurely stroll down Kennedy Street NW. In 2014, there were several sightings and altercations with turkey groups (also called rafters) in the Maryland and Virginia suburbs. 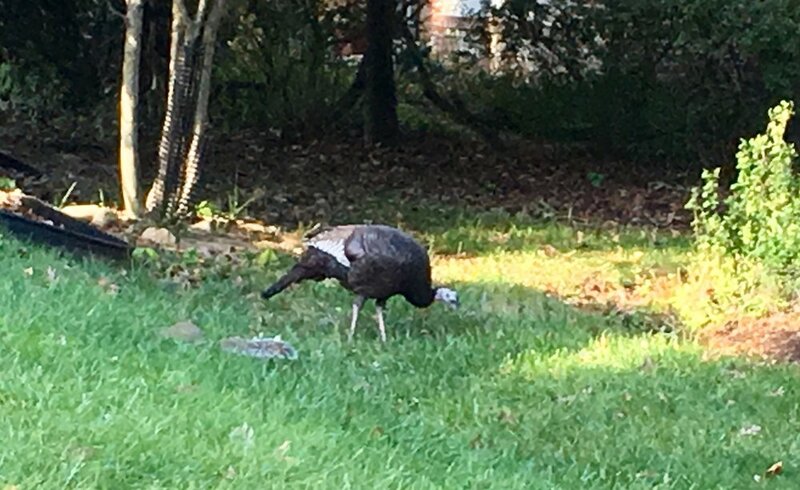 Wild turkeys can walk one to two miles in a day, which can account for various sightings of the same rafter across the DMV. The Smithsonian Museum of Natural History lists wild turkeys among the local birds of DC. In fact, wild turkeys can be spotted in every US state except Alaska. The eastern wild turkey is the most common type and you can tell them apart by the brown-tipped upper tail feather found on the male, in addition to its shiny black body feathers. Females, or hens, will have a duller, grey color. They can get aggressive as a way to establish dominance and have been known to run at speeds of 12-20 miles per hour. 1. Do not feed them. This includes making sure garbage can lids are closed and bird seed is not easily accessible. This may be a good time to put away those bird feeders until spring. 2. Establish dominance. Wild turkeys can view people as being below them in rank and may attack. To establish dominance, people should be loud, wave arms around, and take up space by opening an umbrella or spraying water from a hose. Children should be taught how to “haze” turkeys too. While turkeys are large (they can measure between 36-48 inches) and can attack, they are very easily intimidated by any sign of dominance and will retreat. 3. Don’t let them roost. In the case that a wild turkey is roosting on your roof or fence, a squirt of water should be enough to encourage them to move on. 4. Save your veggies. Use hardware cloth or a scarecrow to protect gardens from turkeys. Avoid netting, which can trap animals and harm them. We may live in the big city, but we are lucky enough to enjoy incredible wildlife in our area. Keep your ears and eyes open this season and let us know if you have any encounters with unusual creatures! Gobble gobble!